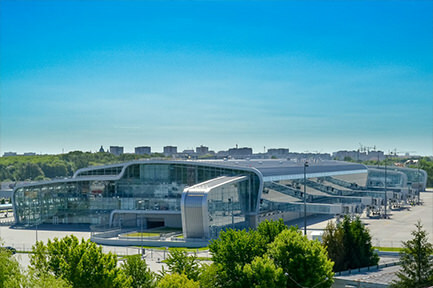 Airport “Lviv” is considered to be the largest in the flow of passengers and the network of routes by the airport of Western Ukraine. It is located in the south of the city – microdistrict Sknilivka. However, its story did not start at all in this location. Few people know this, but the first airport in Lviv was built in the area of ​​Levandivka. From the very beginning, the airport in the city of Lion fulfilled exclusively military function and it was built by Austro-Hungarian power in 1914. The first passenger airplanes in Levandovsky airport arrived as early as 1922 – the first regular connection was the Gdansk-Warsaw-Lviv route. These aircraft were flown once a day from 05.09.1922. Of course, initially the military airport was not quite suitable for tourist purposes, therefore passenger transportation was not the most convenient here – the station was in railway cars, which were only a few, and later – in a small wooden house, which, however, still was not enough great for this purpose. As everything around the airport has already been built up – expansion was impossible, and civilian airlines were in demand. Then it was decided – the new airport. The locality became the village of Sknilov. The land for this purpose was sold to all well-known Sheptytsky brothers. The decisions were made in 1923, and in 1929 the Lviv airport was relocated from Levandivka to Sknilivka, although the construction work at that time had not yet been completed..
Only 5 years after resettlement to the airport railway lines were brought up – to bring fuel and other materials, and next year an airdrome radio station, a meteorological station and a commissioned flashlight were launched for flight at night. Four years later, in 1938, radio beacons and range measurements appeared. At the same time, at the end of the 1930’s, a passenger waiting room was finally set up and the airport was fully adapted for civil aviation. In the interwar times for passengers was an interesting interesting feature – a transfer from the city center to the airport. It was free! And for VIP clients, there was a special passenger car. On the territory of the airport there were carriers, which brought to the necessary item baggage at no additional charge. Hard to imagine, right? After all, for such a request even on vacation ask for additional tips. And it’s hard to imagine the fact that the processing of documents took place in very short terms – up to 15 minutes. However, although everything was ideal for a certain period of time, a war began. When Germany invaded Poland, on the first day of the war, the Lviv airport was bombed. The runway was seriously damaged and during the evacuation of several planes from Poland they were in serious accidents. In 1944, the Red Army rebuilt Lviv, and the airport began to recover gradually, air routes to Kiev and other countries were restored. So the airport is still functioning. The last reconstruction was carried out here in 2009-2012. Lviv airport was preparing for the European Football Championship 2012. The new terminal was built in high-tech style, renovated the old terminal and runway, which was extended by more than 800 meters. It took about 2.5 billion hryvnias. Today, the airport in Lviv hosts many destinations and guests from most countries of the world. When arriving to Lviv for business or for rest, you should always take care of your home. Renting an apartment or hotel near the airport in Lviv is not very convenient – it’s not only the constant noise of the aircraft, but also the traffic flow of traffic jams. That is why the city center is the best location for any purpose. Choosing not Lviv hotels near the airport, but in the center, you get a number of advantages. Edem Hotel will gladly host guests and allow you to quickly get to all the well-known locations in Lviv. From us to the airport only 15 minutes drive! We offer breakfast in the price of the room, pleasant prices and quality service. Are waiting for you!